Smaller than typical 3-row SUVs, but big on tech and value. Also offered in a 2-row configuration. Great lil’ SUV in general, but been riddled with small problems. 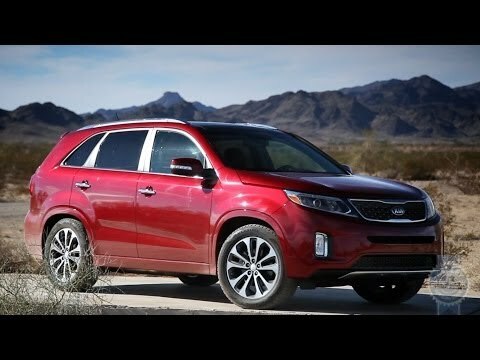 I bought a used 2014 Kia Sorento in 2015. The day after I bought it, my engine light came on. My car went in and out of the used car dealership’s maintenance department. First they said it was just a malfunctioned sensor that they turned off. But it came right back on. Then they said it was just a small hole in some tubing which they fixed. But then it came right back on. I gave up on that car dealership and took it to my mechanic a few months later. He said there was something wrong with the engine and I'd have to take it to the actual Kia dealership. The Kia people told me there was a recall on my engine, so I got a brand new one put in. During that same time, I had to get my front brakes replaced. A little later on the engine light came on again, but this time I was told it was the “fuel level valve” leaking. They said it wouldn’t pose an immediate problem, but would need to be replaced eventually. This was estimated to be a near $800 job. That was months ago and I haven't done it yet. Everything seems to be running just fine and I have had no issues, despite the lights. Oh and my ac went out in the middle of south Texas summer. It is a great car for what I need, but it has been kinda riddled with some small-ish failings. 2014 Kia Sorento - big and safe enough for big family! I love my 2014 Kia Sorento! I love the amount of space it has and I like that you can get a third row seating or just the two rows depending on how big your family is. It is big enough for kids as well as animals to fit in the very back! I hardly have any issues with anything mechanically which is always a plus! I also love that it is a very safe vehicle! With having children I needed a reliable SUV with great safety features! My daughter absolutely loves the air vents in the back that are next to the doors so that she can turn her air towards her or away from her without having to ask me to do it for her! Overall I have not had any issues with my 2014 Kia Sorento and I would buy one again if I had to! 2nd generation 14 Kia Sorento ex. I bought this vehicle from carmax, so it is used, but it is very comfortable, reliable, and has great features. I love the dual air unit, so I can have it warmer while someone else has cold and vice-Versa. It has stable and clear Bluetooth which I can take calls or listen to music. I have a backup camera to make sure I can see what's directly behind me. I am not fond of leather but that is the only option for my trim level. --ex-- and with it being leather, it gets hot in summer. I do not like that I cannot change my music station if I have the car in reverse. The size is good, and can fit a child seat and two adults in the back. I like the option for a third row if necessary. The trunk is spacious. Kia Motors Corp. is recalling certain model year 2014 front wheel drive Sorento vehicles manufactured January 7, 2013, through March 12, 2013; and equipped with 2.4 liter engines. Due to a manufacturing issue, the right front axle shaft may fracture. A fractured front axle may result in a loss of power to the wheels. Additionally, if the vehicle is parked without the parking brake applied, it may roll away. Either condition increases the risk of a crash. Kia will notify owners, and dealers will replace the front axle shaft assembly, free of charge. The recall began on September 9, 2013. Owners may contact Kia at 1-800-333-4542 . Kia's recall number is SC099. Kia will notify owners, and dealers will inspect the engine assembly, and replace the engine if necessary, free of charge. The recall began June 20, 2017. Owners may contact Kia customer service at 1-800-333-4542. Kia's number for this recall is SC147.